Despite extended, aggressive use of conventional antibiotics, drug treatment of bone infections frequently fails as a combined result of the widespread of drug-resistant bacteria, poor accessibility of many antimicrobials to the deeper portion of the bones, the ease of biofilm formation on the bone surface, and high risk of drug toxicity. Emerging therapeutic nanotechnology offers potential solutions to these issues. In recent years, a number of nanoantimicrobials, i.e. 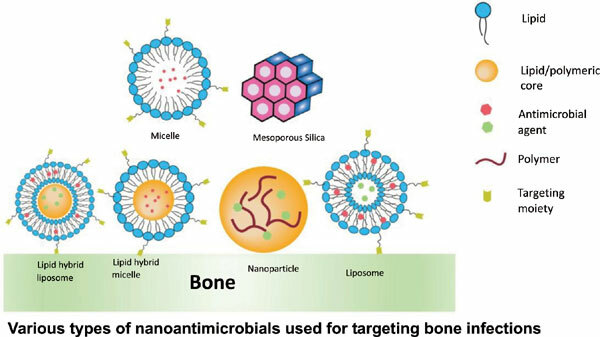 nanoscale devices with intrinsic antibacterial activities or capacity for delivering antibiotics, have been developed for the treatment and prevention of bone infections. These nanoantimicrobials can be designed to have controlled and sustained drug release kinetics, surface-modifications for bone or bacteria targeting, and increased affinity for biofilms. Given the potential value of nanoantimicrobials, clinical application of nanoantimicrobials for bone infection treatment remains scant when compared with the number of ongoing research. It is, therefore, a good time to carefully examine this promising yet relatively uncharted area. This review will extensively discuss the development and state of the art of different classes of nanoantimicrobials for bone infections with emphasis on the treatment aspect and identify the factors that prevent the clinical translation of nanoantimicrobial therapy from bench to bedside. Osteomyelitis, antibiotics, nanotechnology, nanoantimicrobial, drug delivery, targeted delivery, bone.